Old Man Winter is upon us and, frankly, nothing says welcome home like a pot of simmering soup. Honestly, I could eat soup every day, especially when the wind is blowing and the temperature outside is cold. Soup is definitely a classic comfort food. I still believe nothing helps you feel better or helps get you get over a cold faster than good old homemade chicken soup. There are some who feel like soup is just the first course and it can be, if you are only having a cup. For most of us, however, soup can be a satisfying main course, especially with the hearty soup recipes. 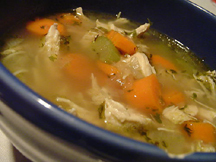 Many soups are even better the next day after they have spent some time in the refrigerator. Ham and beans is the one that comes to the fore front of my mind. Soups are also a wonderful way to utilize leftovers. Today, the recipes for soups are endless; they are no longer just a way to use up a bone for broth. I’m always fair game for a new soup recipe. Another plus for soups, is that you can put them in the crock pot, leave and come home to that wonderful aroma of simmering soup. Add a bit of fresh bread to your menu and you will feel like you have died and gone to heaven! In a crock pot, combine carrots, celery, potatoes, broth, onion, vinegar and tomatoes. Let simmer on low for 4 to 5 hours. 20 minutes before serving add escarole, pasta shells, and canned beans. Top the soup off with grated parmesan cheese just before serving. I must admit outside of the broccoli this probably isn’t the healthiest soup. I still think that it’s worth it! In a small sauté pan melt butter and sauté onion. Add the butter and onion to a large soup pot and add the broccoli, chicken stock and simmer until broccoli is tender, reduce heat and add cheese cubes. When cheese cubes are melted add the cheddar cheese, milk and garlic powder. In a separate bowl mix cornstarch with the water; add into soup, stirring until thickened. Combine squash, potatoes, apples, onion, water and broth in a crock pot. Cover and cook on low for 5 hours or until potatoes and squash are tender. Add in pumpkin pie spice, pepper and brown sugar; let set for 10 minutes to blend all flavors together. Garnish with finely chopped walnuts. Tip: place the squash in the microwave for 3-5 minutes on high and it will peel easily. In a soup pan, heat oil on medium heat; sauté onions and carrots. When onions and carrots are soft add in the garlic. Add in broth, tomatoes, sugar and tomato paste. Simmer until tomatoes are tender – about 15 to 30 minutes. Puree in blender. Place pureed mixture back in pot and add can of evaporated milk, salt and pepper. Reheat if necessary. The difference between this soup and grandma’s is that she used a chicken and vegetables mixed with water to create a broth. Although this is delicious, most of us don’t like to take the time to simmer this concoction for a couple of hours and then have to shred the meat off the bone and strain the broth. So we do things a little different. We generally buy canned chicken broth and use leftover chicken or canned chicken. If you aren’t used to the way grandma made her soup, you will never know the difference. In a soup pot, over medium heat, sauté the onion, carrots, celery, garlic and bay leaf in olive oil. Cook for 5 minutes. Pour in chicken broth and bring to a boil. Cook for another 10 minutes. Add noodles and cook according to the time on the package. Season the soup with thyme, salt and pepper. Simmer for a few more minutes and it’s ready to serve. So let it snow and let the wind blow or let it rain and hail – just let me come home to a pot of hot, simmering soup.